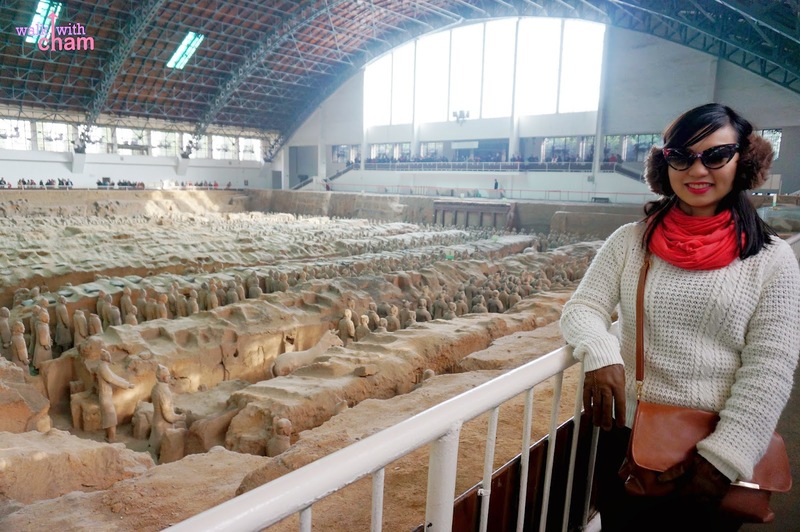 I came in full circle as I started my China journey in Beijing at the Forbidden City to witness where the last emperor reigned and finally travelled to Xi'an to see the Terracotta Museum where the first emperor was buried together with his terra-cotta warriors. 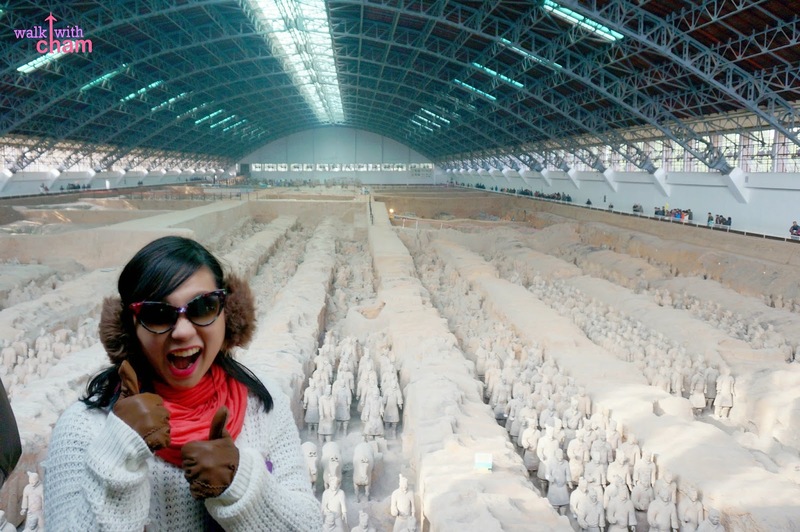 My first encounter of the Terracotta Warrior was in the film The Mummy Tomb of the Dragon Emperor and just like any other historical landmarks I longed to see the site where hundreds of detailed life sized terra-cotta armies are on display and is considered to be one of the greatest archeological sites in the world. 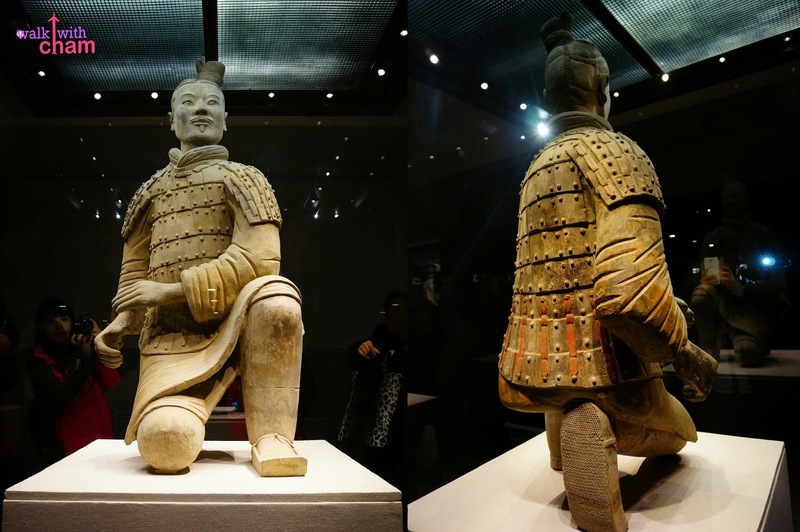 Terracotta Warriors is a collection of terracotta sculptures which replicates what the imperial guards/ armies looked like during the reign of Emperor Qin, the first Emperor of China. 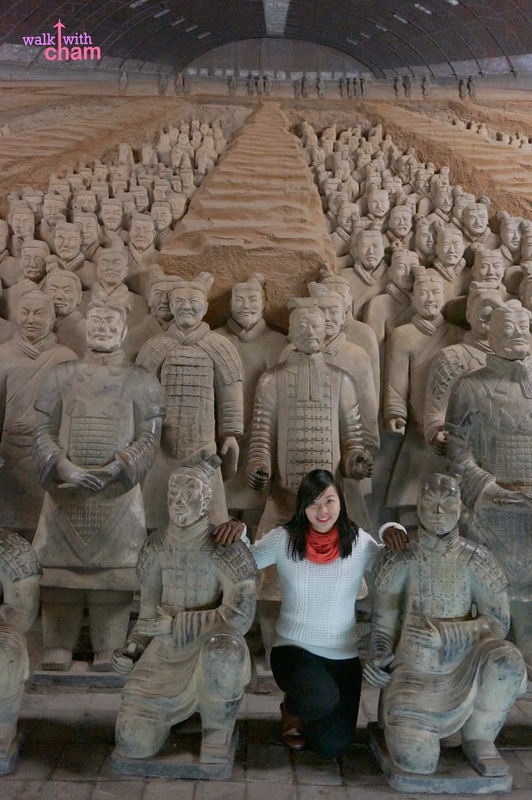 The main purpose of the terracotta warriors was to protect the emperor in his afterlife. 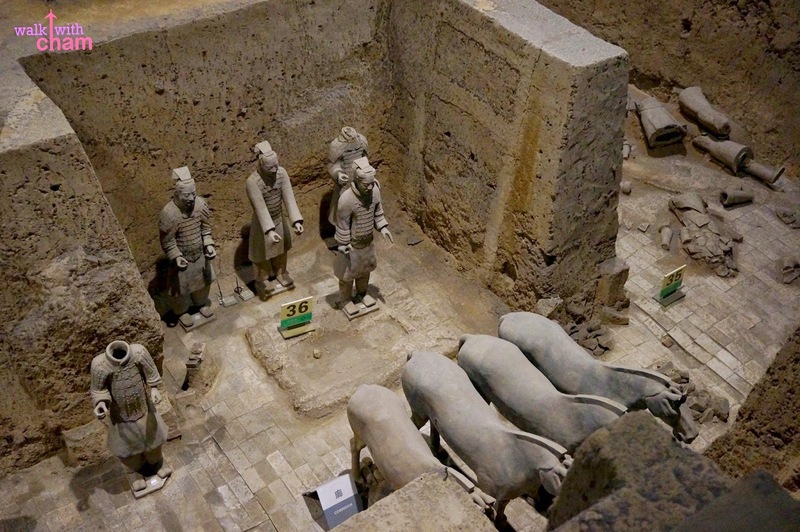 Emperor Qin (pronounced as Chin) is where China derived its name. 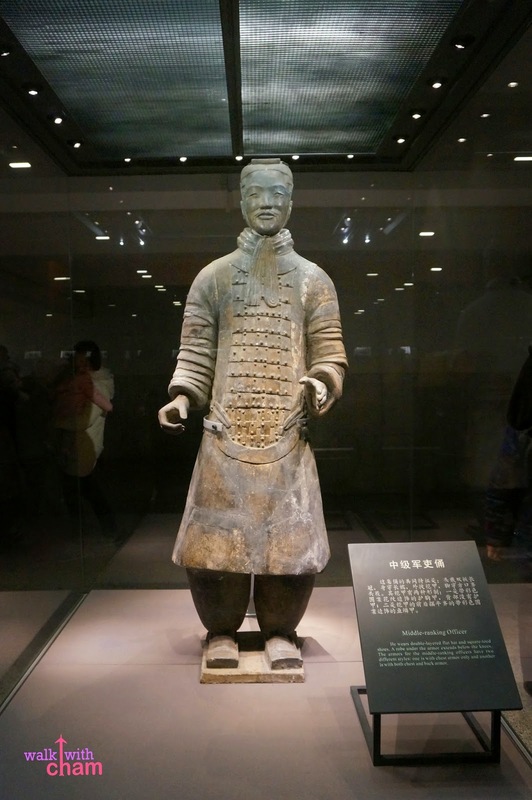 He is the first emperor in Chinese history because at the age of 39 he was able to conquer six states in ancient China. 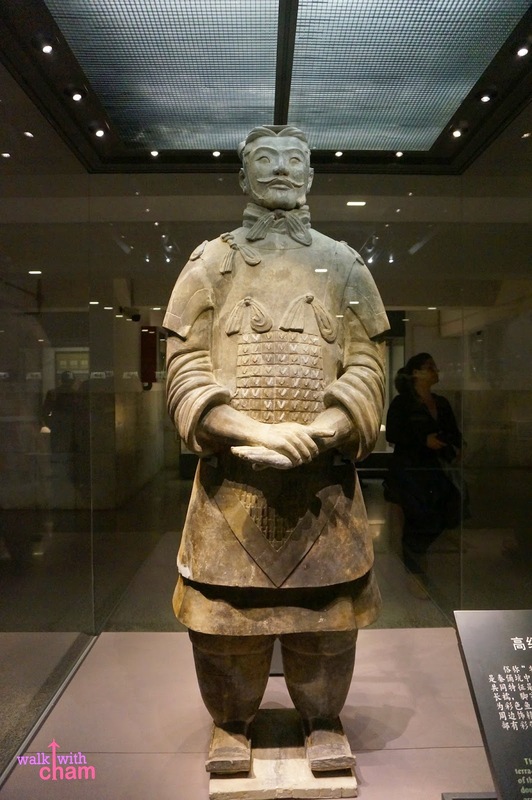 Emperor Qin has a great fear in death so he looked for an elixir of immortality but ironically at a relatively young age of 50 he died. 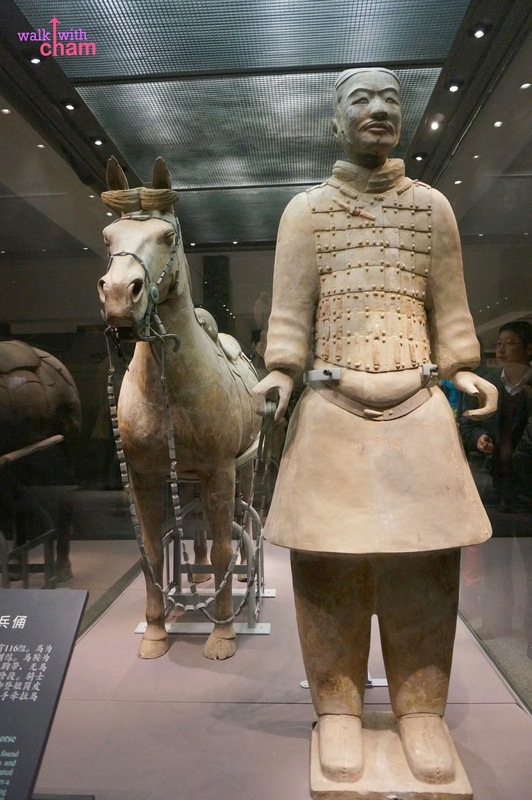 Before his death he ordered the construction of his tomb and terracotta warriors early on his reign because he believed that there is life after death. 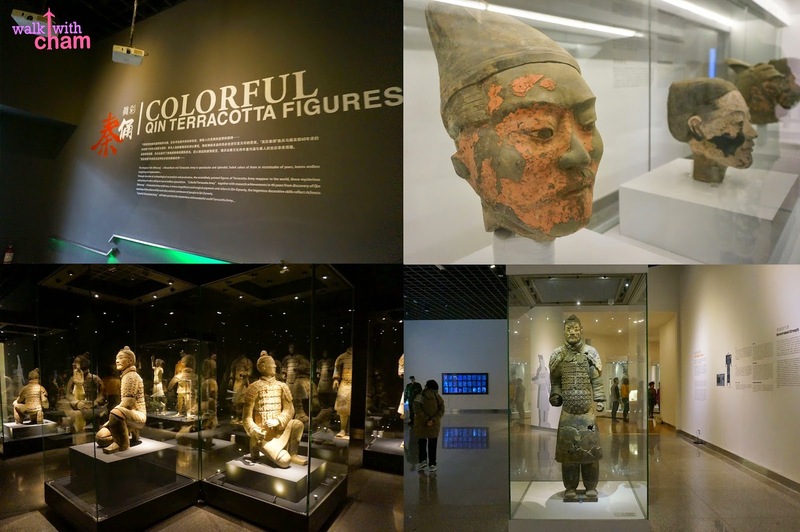 The museum is widely known as the biggest on-site museum in China that is part of the UNESCO world-class cultural heritage list. 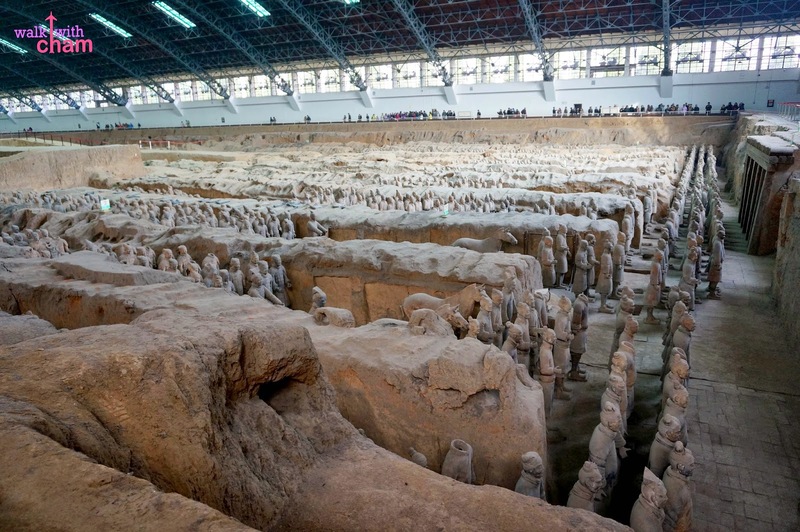 It is considered to be the most significant archeological excavation of the 20th century and a site not to be missed by anyone visiting China. 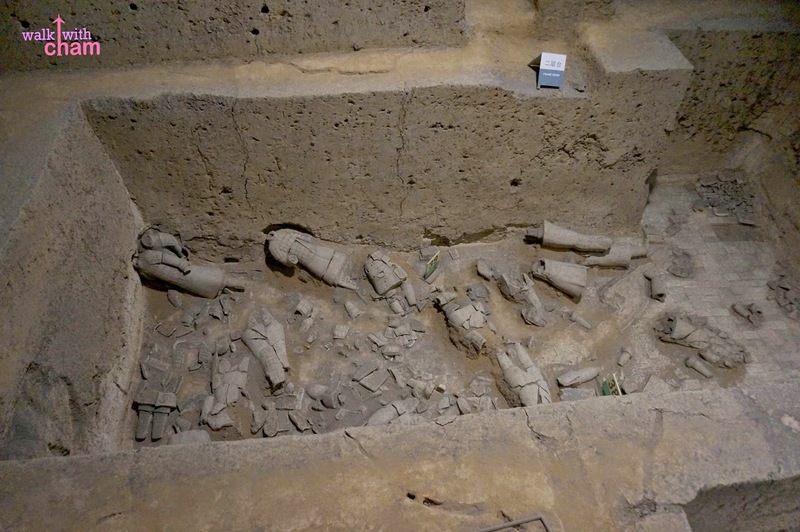 Discovered by a group of farmers (some are still alive!) while digging up a well in 1974, this led to the revelation of one of the three pits. 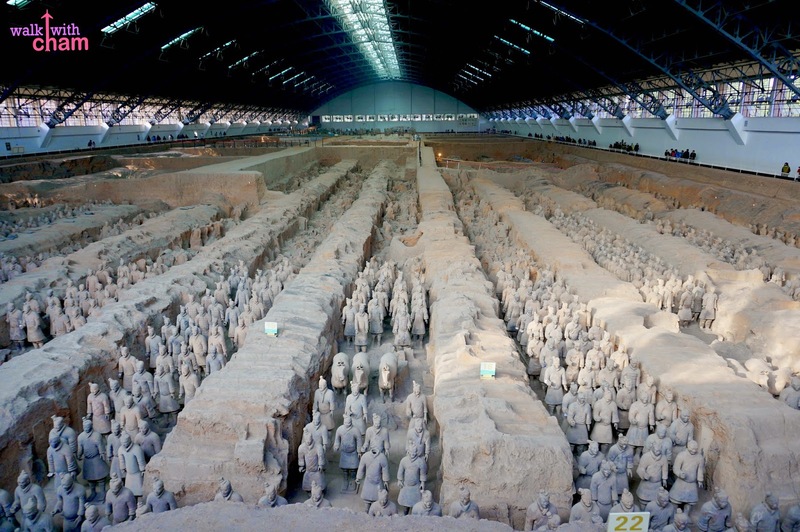 The army held an estimate of 8,000 soldiers, 130 chariots with 520 horses and 150 cavalry horses. 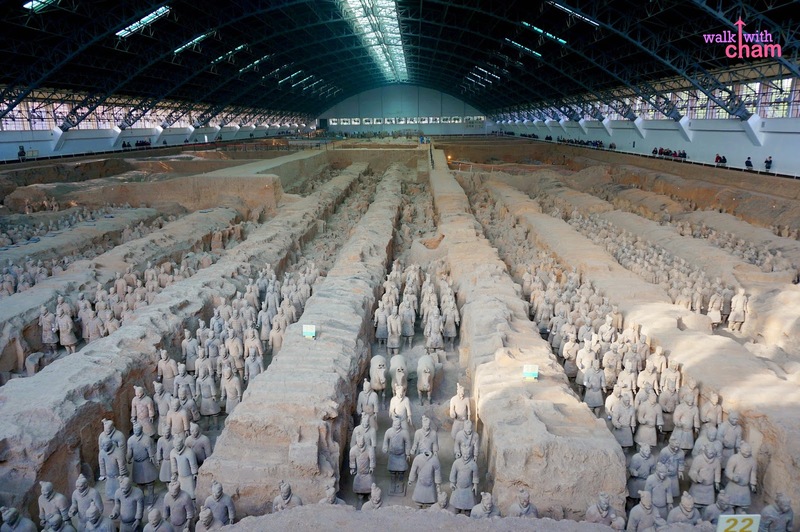 Xi'an is far from Beijing (12 hours via sleeper and 5 hours via high speed train) but because we desperately wanted to see the armies we allotted a night and day just to see them. 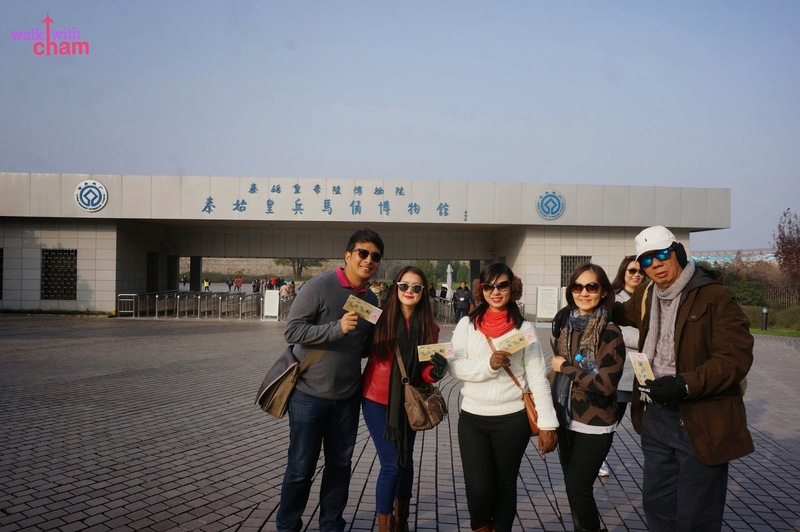 The cheapest way is to ride a tourism bus no 5, fare is 8 CNY (P58). 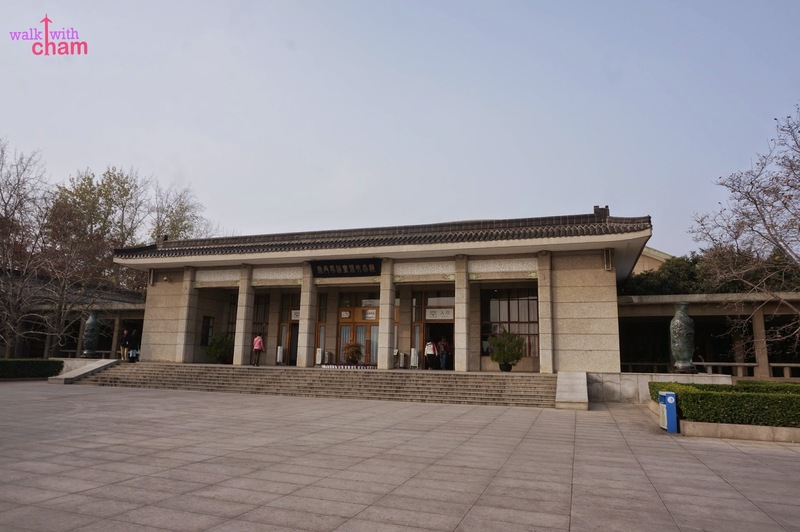 It was too late when we realized that the sleeper train railway station (Xi'an Railway Station) is different from the high speed train railway station (North Railway Station). We booked our return ride from Xi'an via high speed train in North Railway Station but we left our luggages at the Xi'an Railway Station. It was a MAJOR FAIL!!! 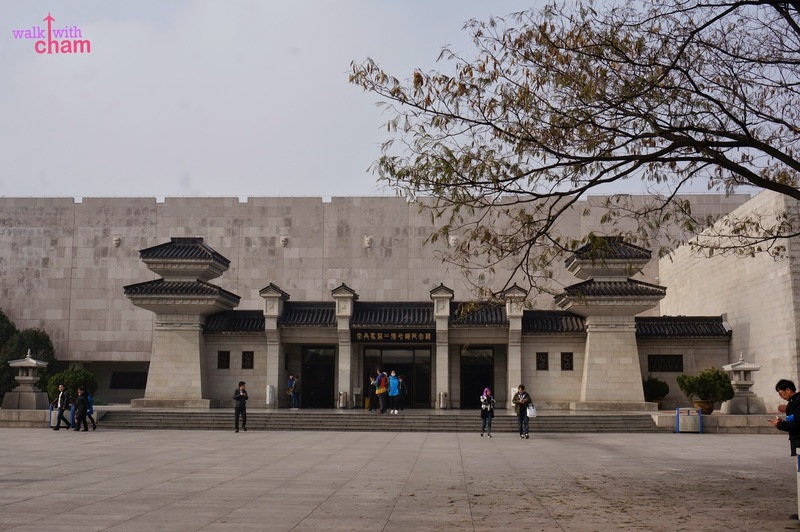 So we had to go back to Xi'an Railway Station just to get our luggages then travel to North Railway. 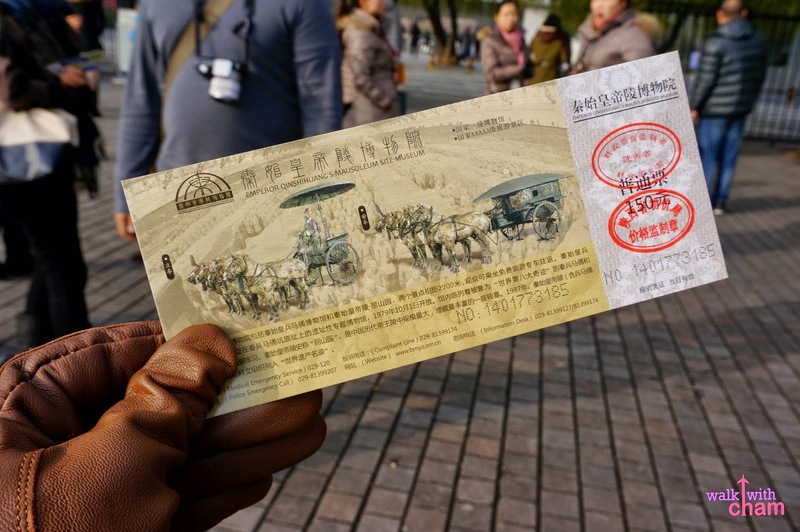 It was such a waste of time and money since there is a FREE Shuttle bus from the museum to North Railway Station. 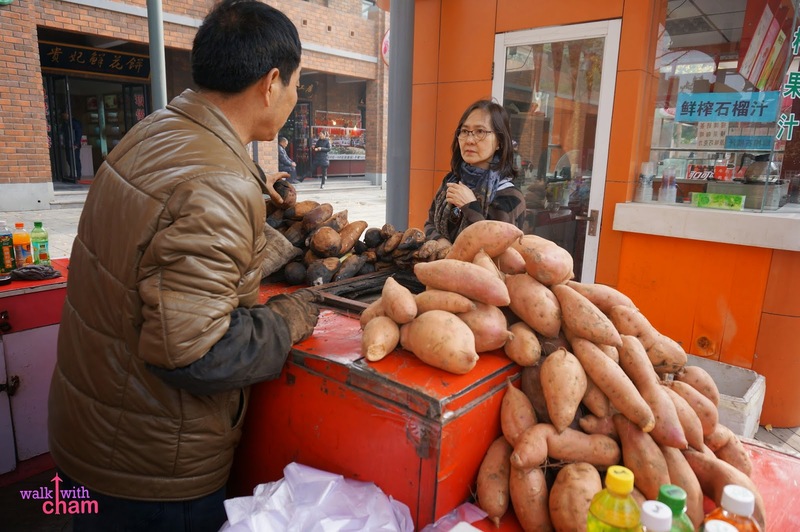 And because we were having a difficult time talking to locals we opted to look for an english speaking tour guide so that we could maximize our time and also ask questions regarding our travel back to Beijing. Rei approached me and asked if I wanted a service of a tour guide with a fee of 150 CNY (P1,080) so of course we gladly obliged. Rei said that we can tour the entire place for only 2 hours if we need to go back early. Take note that here in the museum they offer free Left Luggage. So leaving our luggage at the railway station with a 10 CNY fee was the biggest mistake ever. kainis. 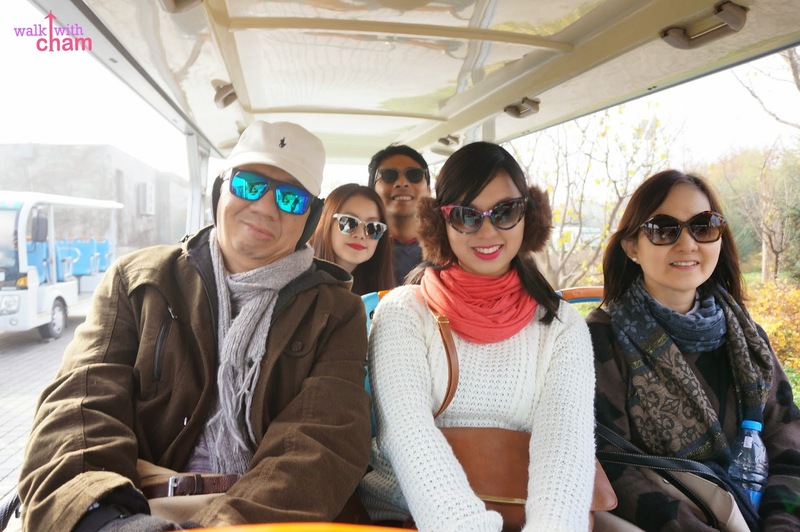 Rei said that it would take 20 minutes to walk from the starting point going to the first pit so she recommended riding a shuttle service for 20 CNY (P144). Going back we realized that walking to the exit didn't take us 20 minutes at all. Ho-hum. 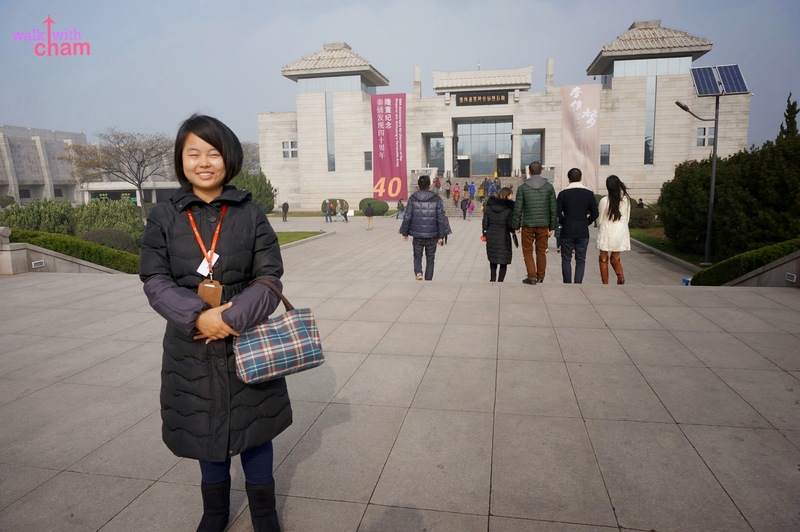 After around 5 minutes we were at the entrance of the museum. 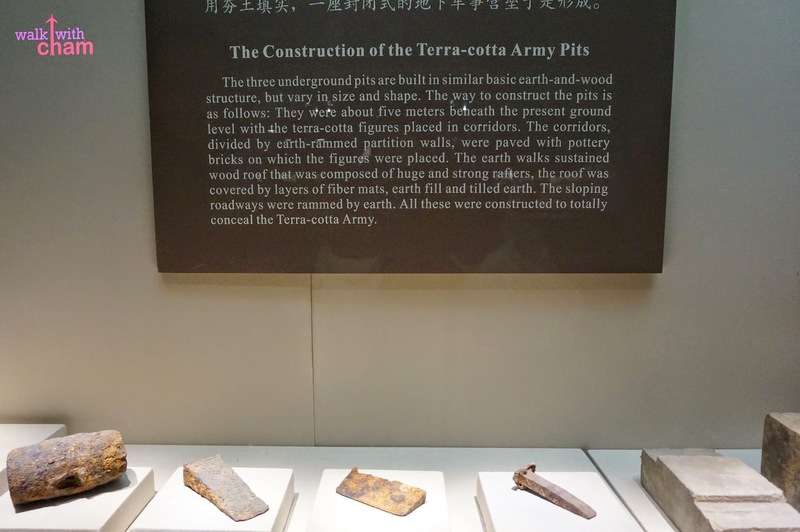 It covers a vast area of 16,400 square meters, divided into sections: Pit 1, Pit 2 and Pit 3 (they where numbered according to the succession of discoveries) plus a Multiple Exhibition Building. 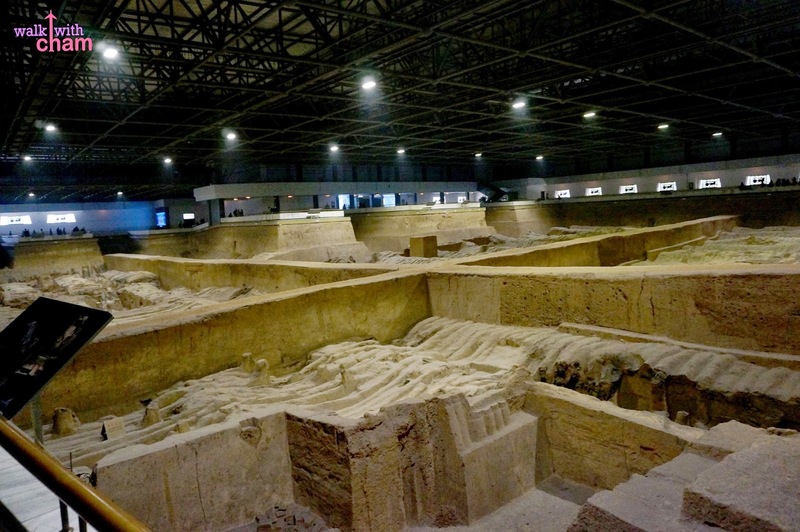 Pit 1 is the largest of all the pits which is 230 meter long and 62 meters wide. 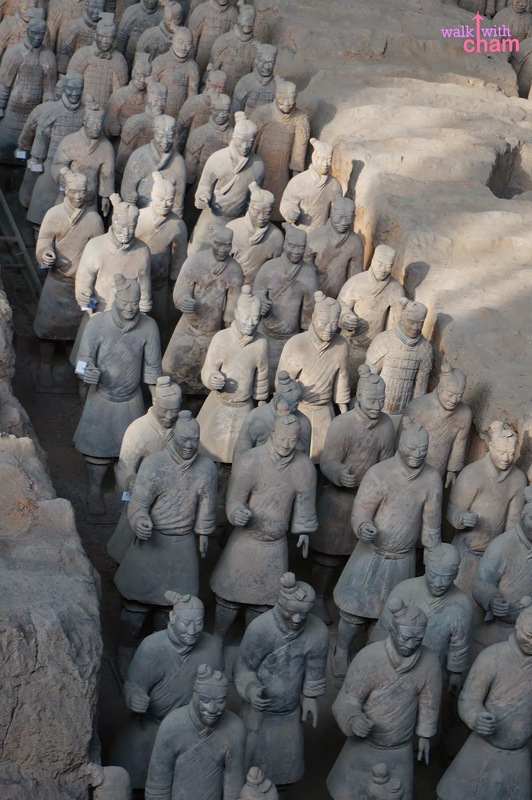 Contains the main army of more than 6,000 figures. 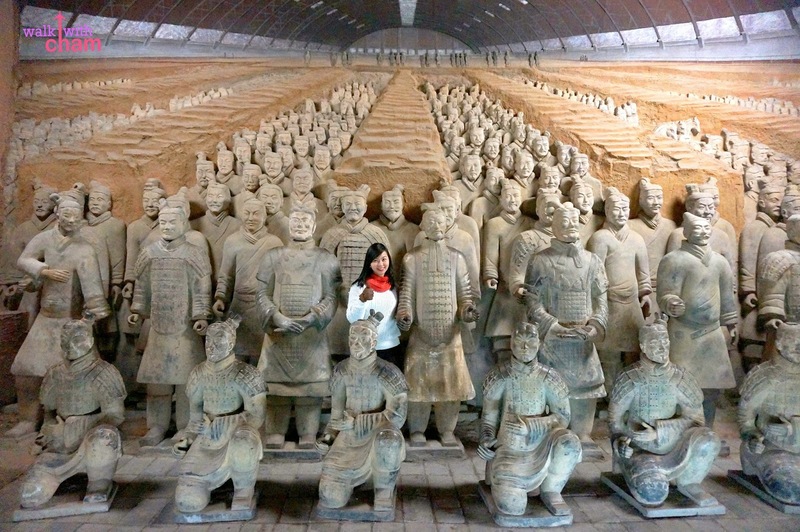 Pit 1 is the most photographed pit because of the impressive array of terra-cotta army. 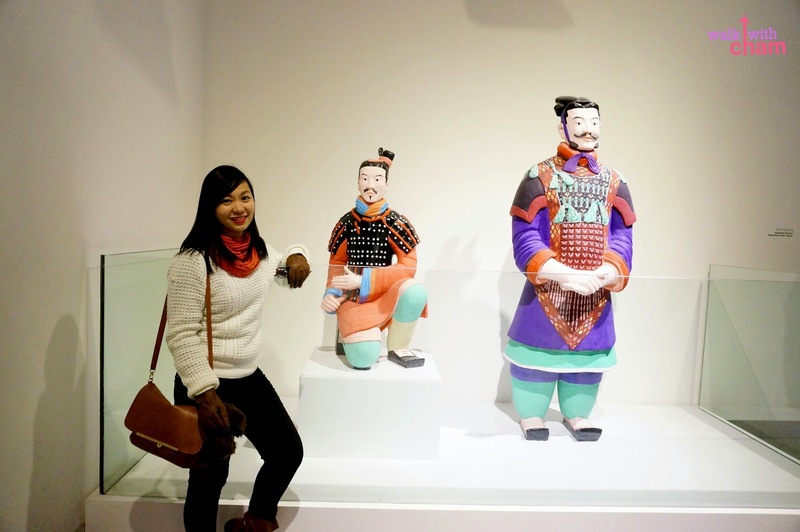 Goosebumps were all over me when I saw the terracotta warriors with my own eyes. Another bucket list that got ticked off. Yay! 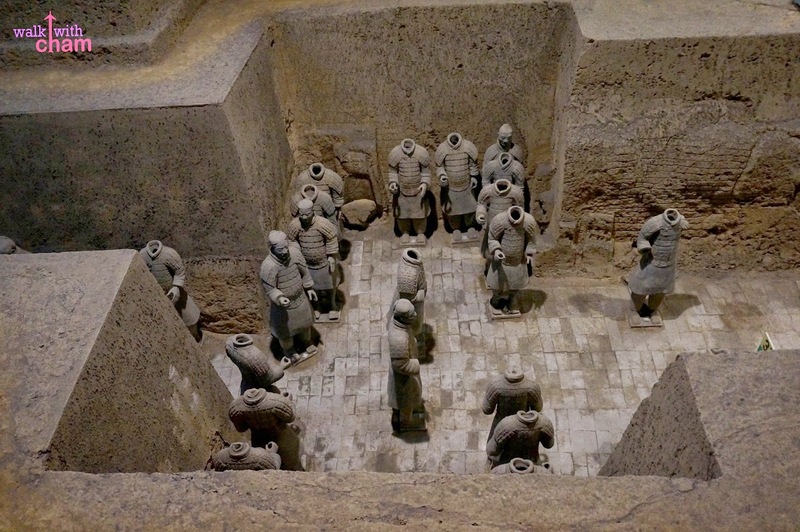 The terracotta warriors are positioned in a battle formation. When you look closely, you'll notice that each figure differs in facial features, expression, clothing, hairstyle and gesture. So no two warriors are alike. Quite impressive. Slow clap. 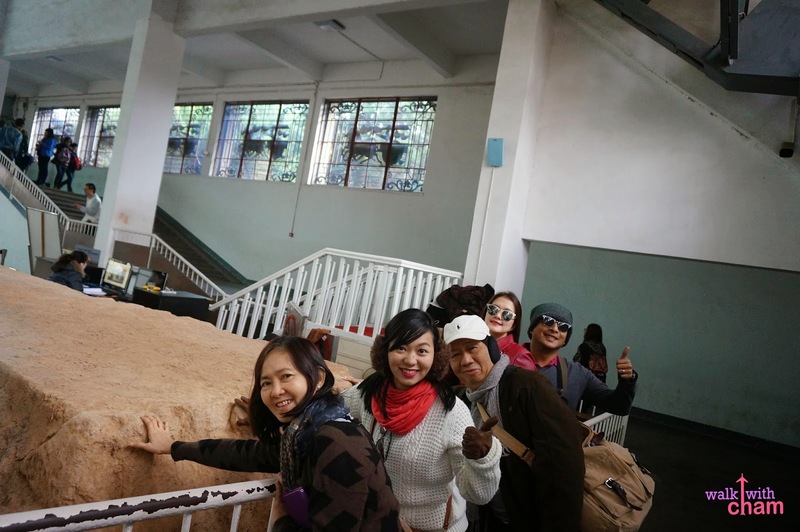 Rei said that the soil in this museum is lucky. So here we were holding it for good fortune. At the left side we saw the area where the farmers made an accidental discovery by digging up a well. 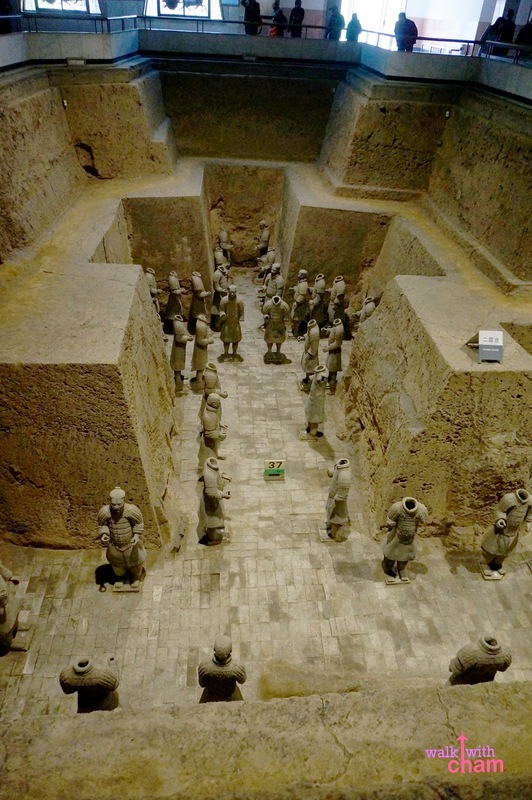 They noticed the unusual bricked floor and clay relics so they called up the Chinese government and the officials immediately asked archeologists to extend the dig. There were tons of information Rei shared but better to discover it yourself so that you can still be amazed when you are at the actual site. Pit 3 is closer to the exit of Pit 1 so this was where we went next. 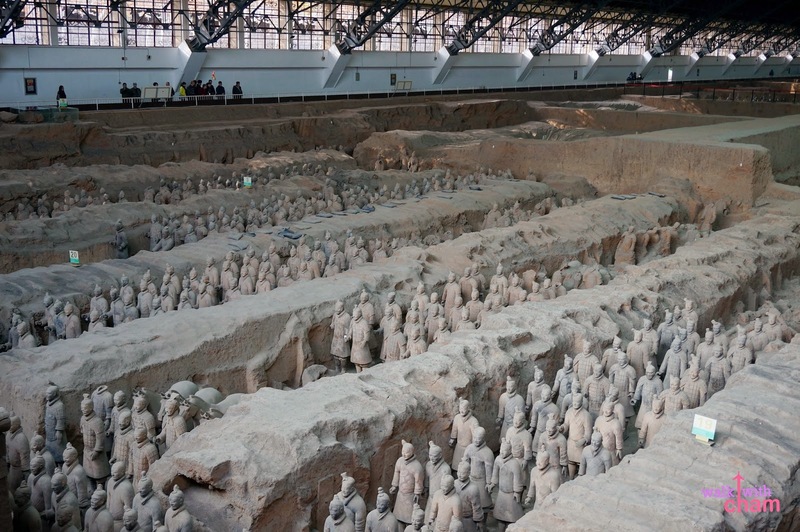 Discovered the year 1976, Pit 3 is the smallest from all the pits and is said to be the command center of the armed forces with 68 warriors, a war chariot and four horses. 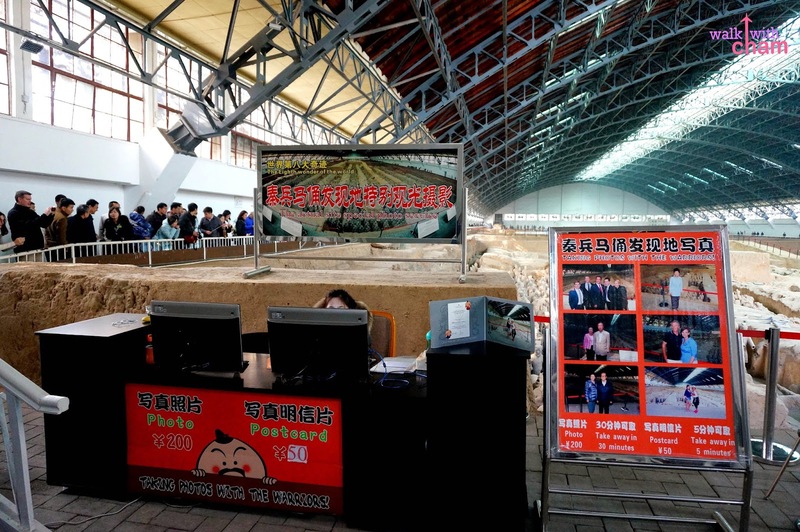 At the same Pit visitors can take photos at the mini studio for a corresponding fee starting at 10 CNY depending on your number. There is also a shop where you can personalize the warrior statue to look like you. But I believe it comes with an unbelievable fee. 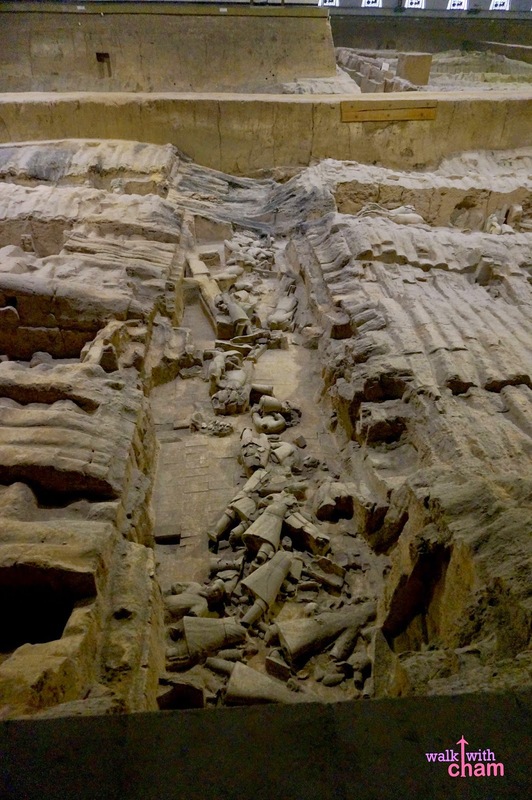 It was found in 1976 and is said that it is the most spectacular of the three pits because the combat formation and army in here are more complex and complete but I beg to differ. 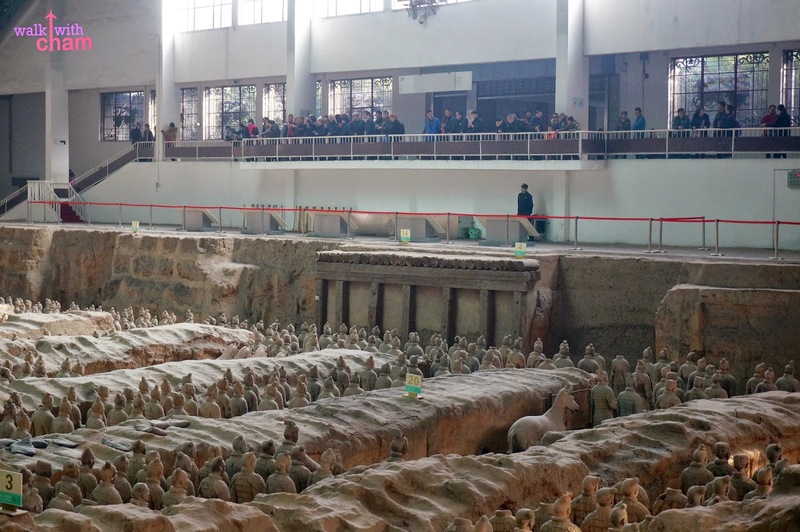 It is said that there are over 80 chariots, about 1,300 terracotta warriors and horses and thousands of bronze weapons but I never saw any of it. Maybe because it wasn't fully restored yet. 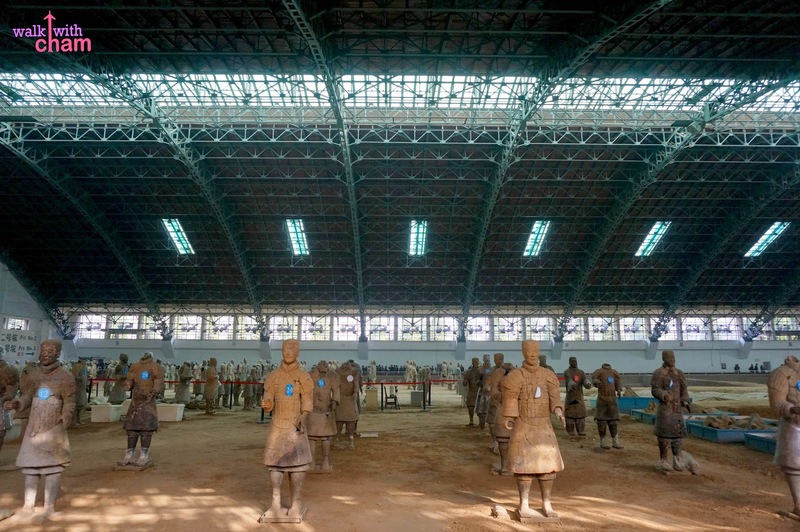 Though a big part of Pit 2 are the display of terracotta warriors in a glass covered pedestals. A one of a kind armored infantryman because the paint is still visible at the back part of its armor. 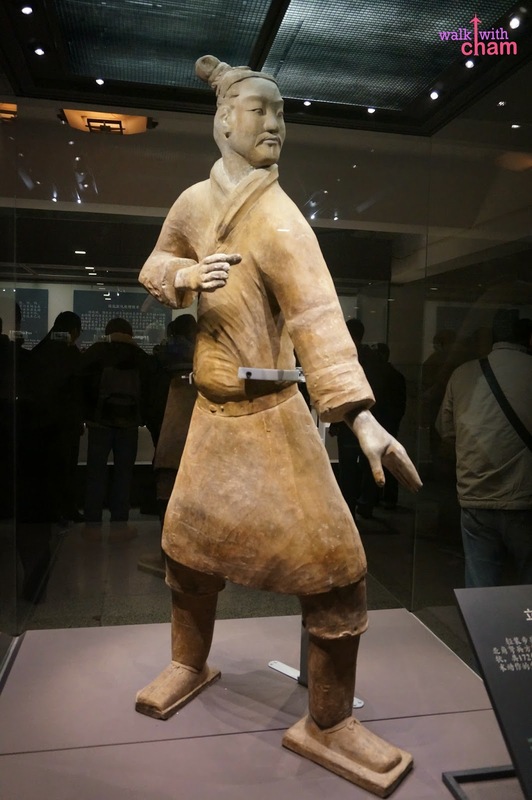 The pose of both hands is an evidence that this soldier held one crossbow originally. He wears a double layered flat hat and square toed shoes. A robe below the armor extend below the knees. 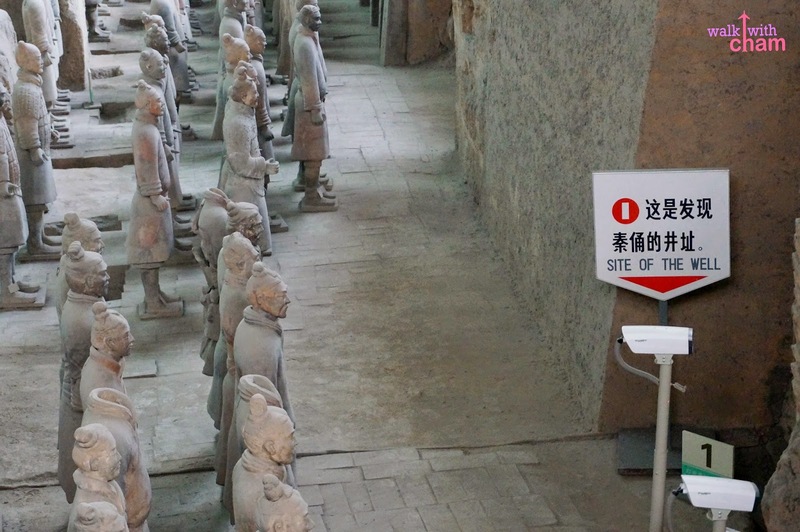 One of the seven generals found in the terra-cotta pits. The height, clothing and head gear all indicate his high rank. 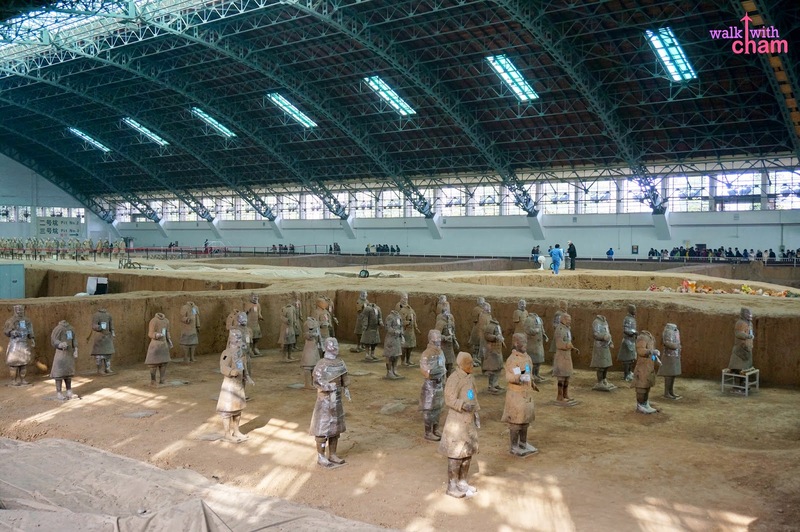 116 Cavalrymen were found in pit 2. He holds the reins in one hand and crossbow in the other. 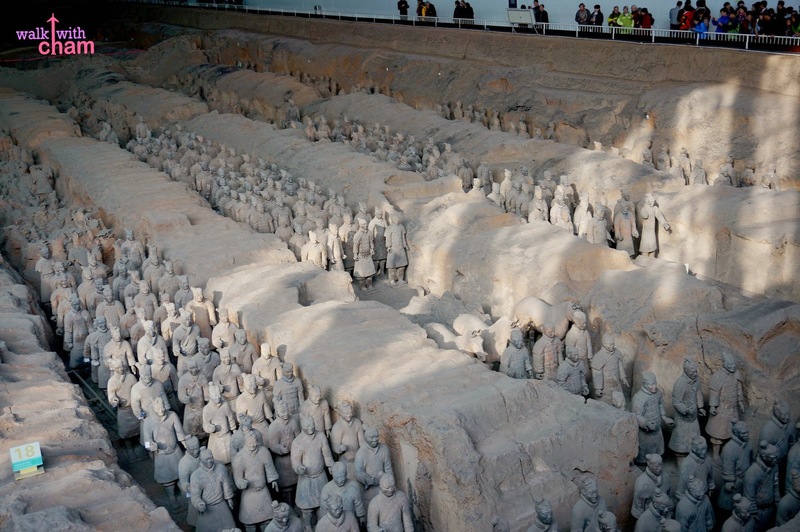 There were 172 standing archer were found in Pit 2. The pose of both hands shows that this figure is ready to shoot. 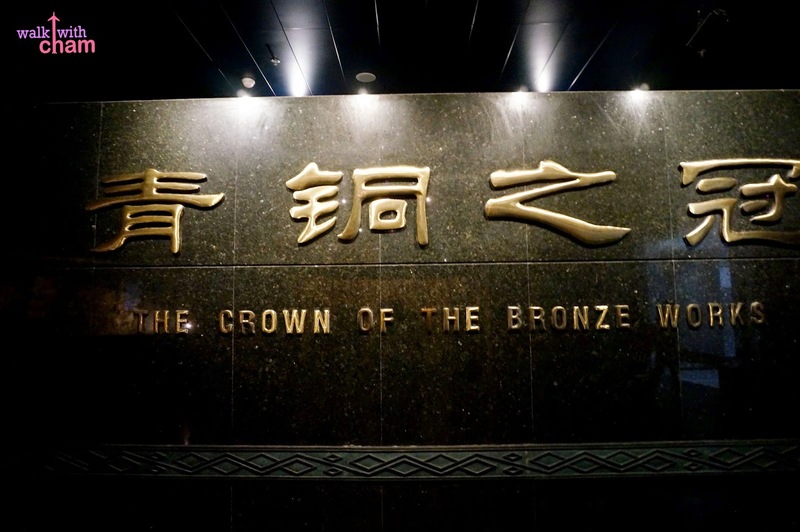 40,000 bronze weapons had been unearthed from the terracotta pits. 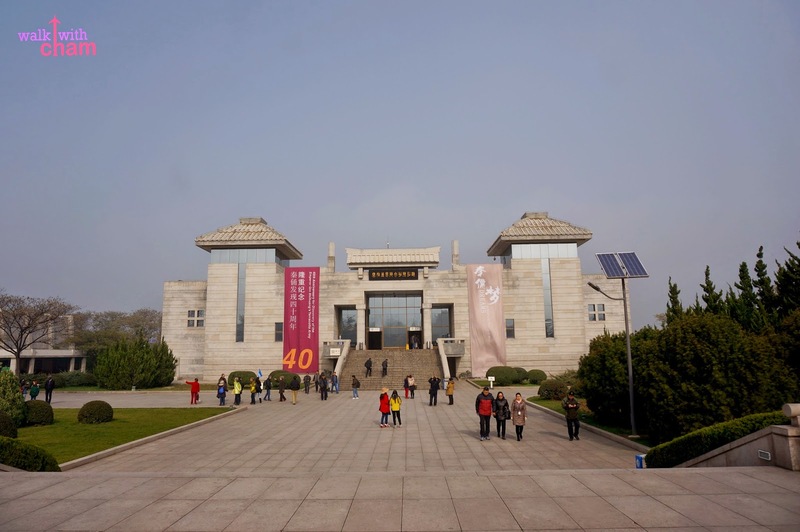 This building houses several exhibitions such as the Colorful Qin Terracotta Figures and Exhibition of Bronze Chariots. 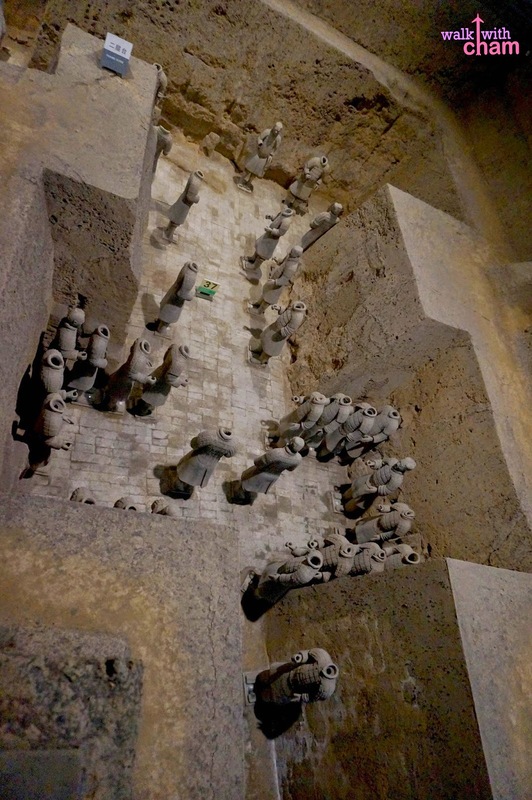 Archeologists had determined that originally the figures were completed with painted details but floods, fire and time had erased the original paint in them. 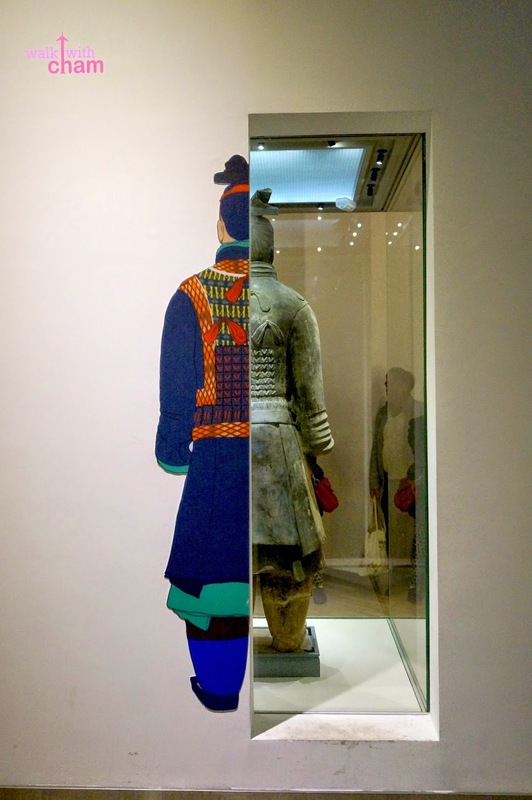 This exhibit shows depiction of what the terra-cotta warriors original appearance looked like. Guided by flakes of paint remains, an approximation of the figures' original appearance can be identified. 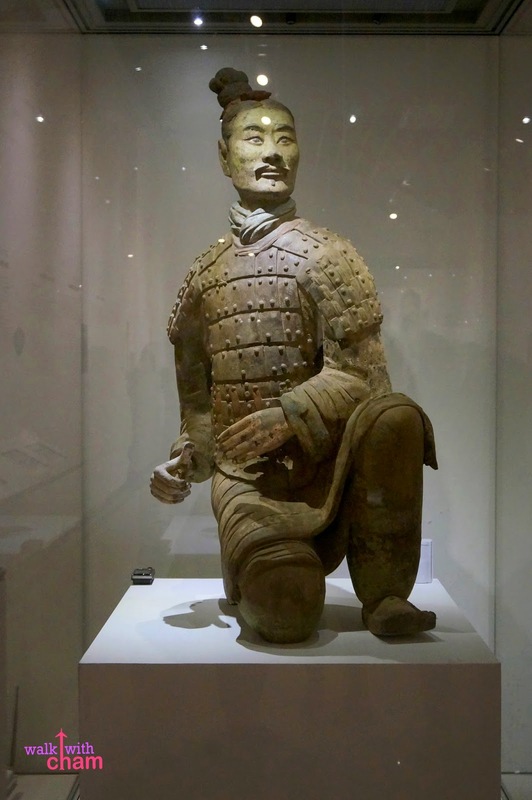 The most famous is the green faced warrior. 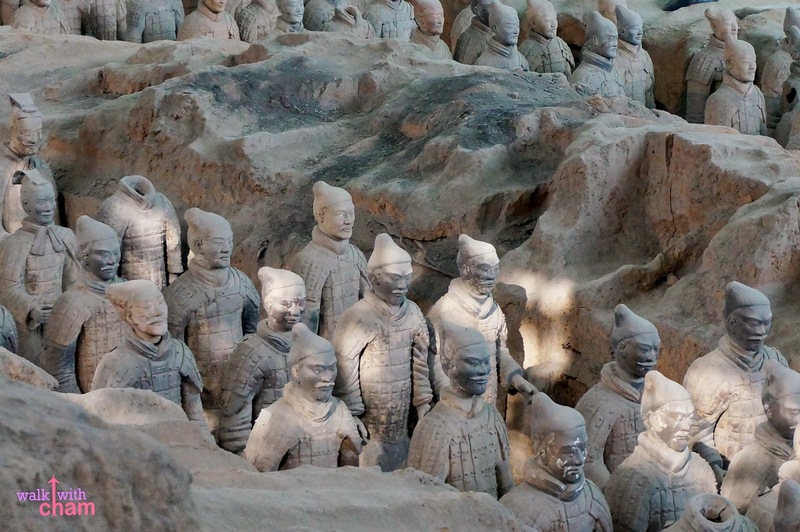 Among the terracotta figures a green faced soldier stood out from the rest. And up until now it still remains as a puzzle to archeologists and historians as to why this particular warrior was colored green. 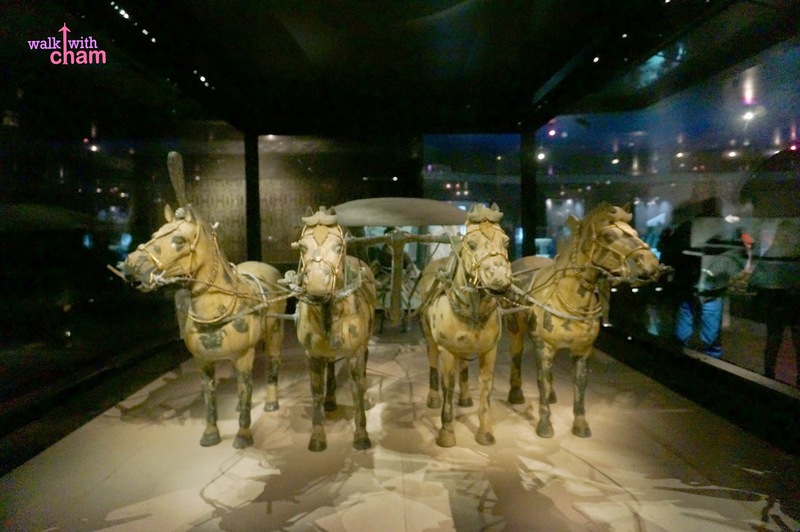 Two large scale models of bronze chariots and horses were unearthed in 1980 about 20 meters from the mausoleum of Emperor Qin. 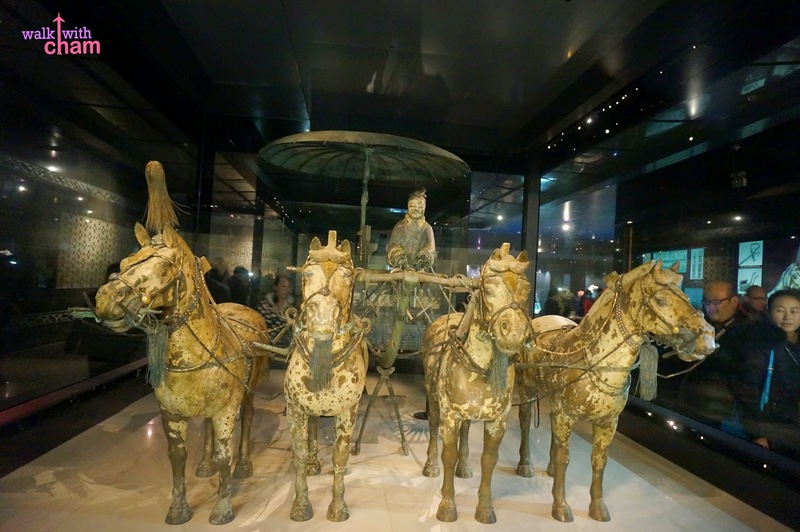 The chariots are half the size of the original which predictably serves as the vehicle of the emperor's inspection tours in his afterlife. 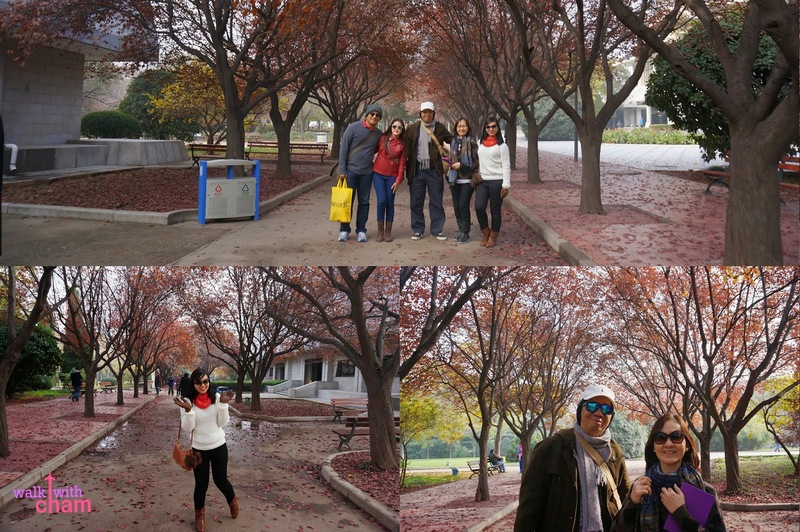 While going to the souvenir shop, we passed by these beautiful autumn foliage and couldn't help ourselves from taking photos. 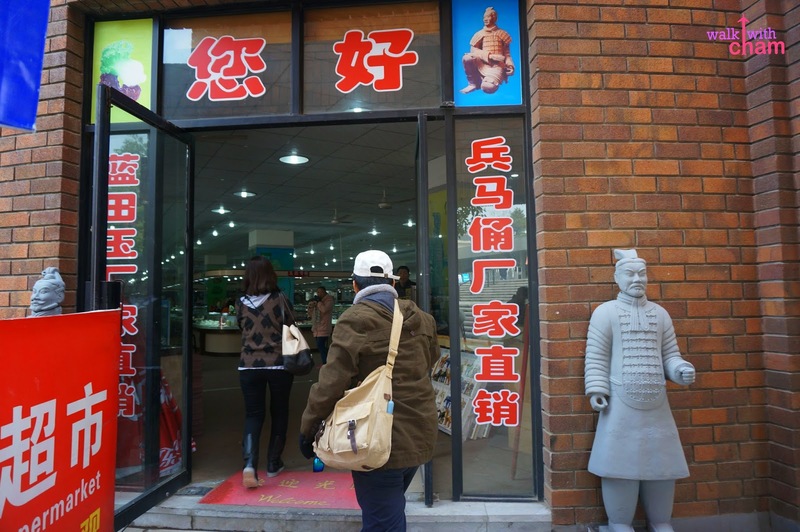 The souvenir shop inside the museum has an expensive collection so we didn't buy anything except for a particular souvenir item which I had been so excited to buy the moment I stepped in the museum..
A Terracotta Book with the signature of the actual farmer/s who discovered the terracotta warriors in Pit 1. They didn't write it but buying a book is the only way for visitors to take a photo with them so I bought one for 200 CNY (P1,439). I was about to lose hope because according to Rei, the farmer recently didn't allow picture taking as he just underwent an eye operation but when I saw the farmer I couldn't help but persistently ask the shop attendant for a possibility to take a photo and they said yes but with no flash- Wow! I was so overwhelmed and became very giddy and everything that happened after that was a blur. 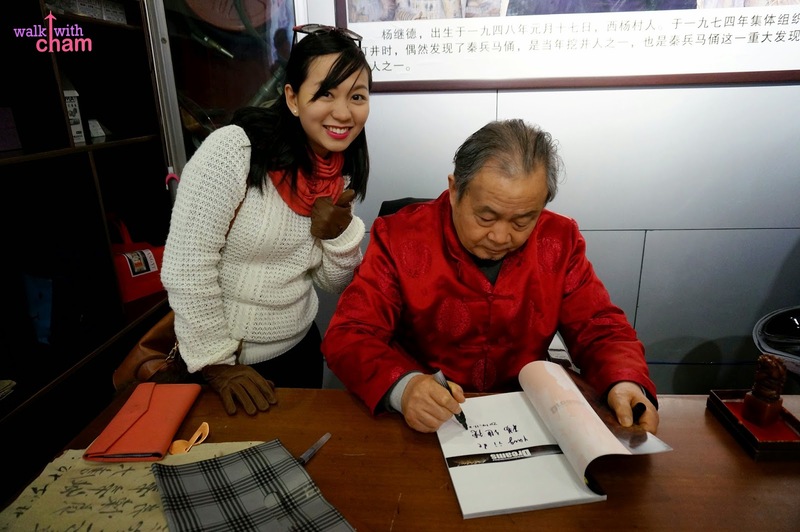 Yang Jide is one of the surviving farmers who discovered the terracotta warriors. I read that according to him many villagers had seen some of the relics but were afraid to tell it to the officials as they might disturb ancient spirits. They were the only ones who had the courage to report it. Yang Jide in the flesh!!! Signing my book!!! Being able to take a photo with Yang Jide was another dream come true for me. 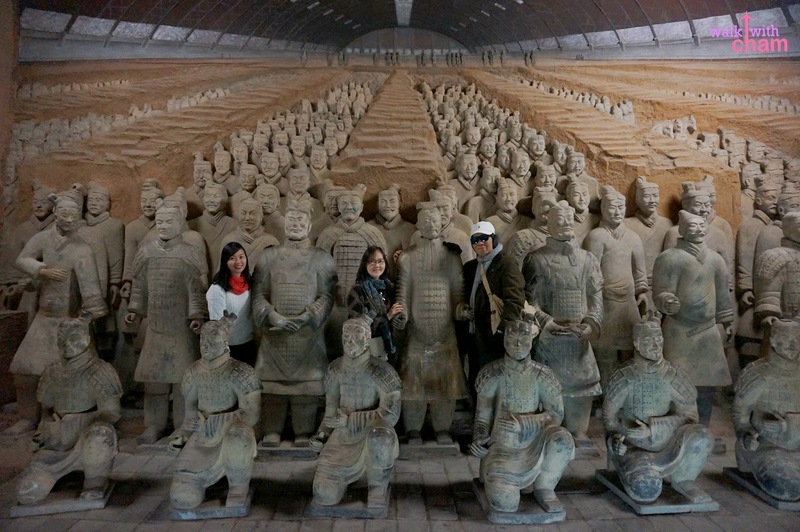 Having my picture taken with the discoverer of the Terracotta Warriors is an important moment that can't be replaced by any amount of money or thing. It was such a overwhelming experience! 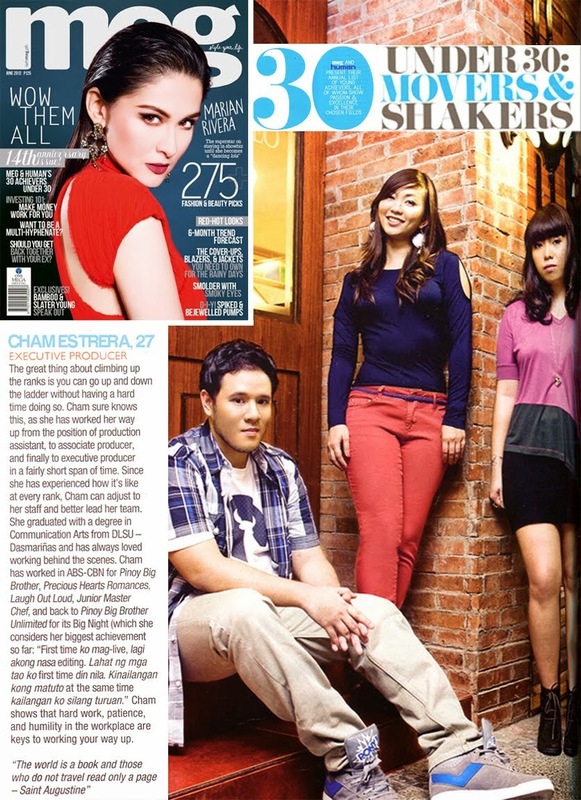 Grabe lang! 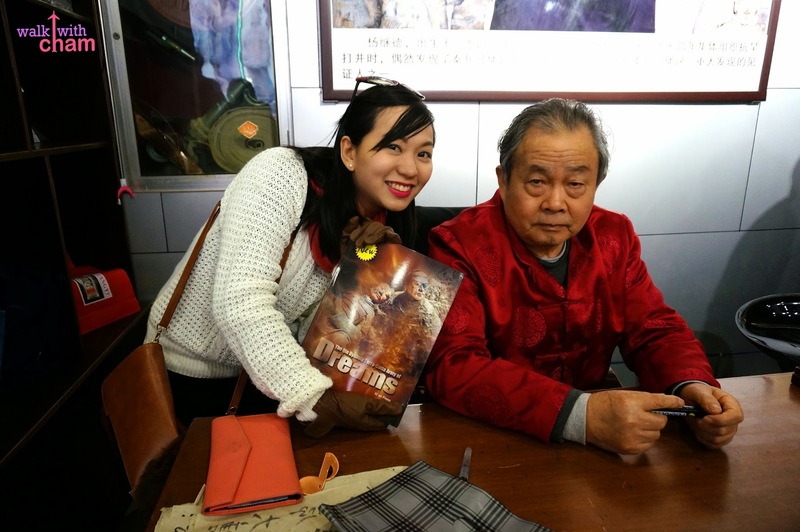 Though I can say that it is evident in his face that he was tired, Yang Jide has been signing books for over 9 years already. I really want to hug him but I was afraid he'd shoved me off. 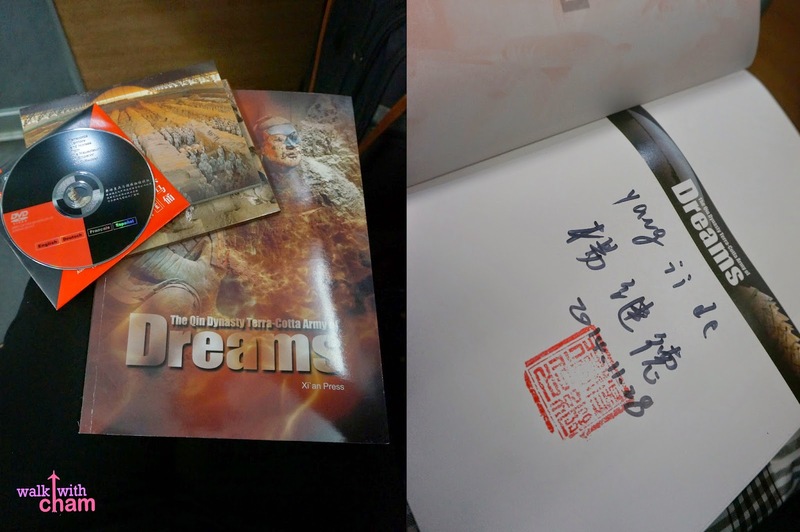 After the picture taking I became so amazed and began to scan the signed book then he, without saying anything handed me my wallet I left beside him. I was so excited I forgot my wallet! Hahaha! I told you it was a complete blur. It was just so nice of him to return my wallet despite his age and condition. I read that they were given a minimum fee per day by the government and it just saddened me that they are not treated the way a discoverer should be treated. :( May God bless him fully. 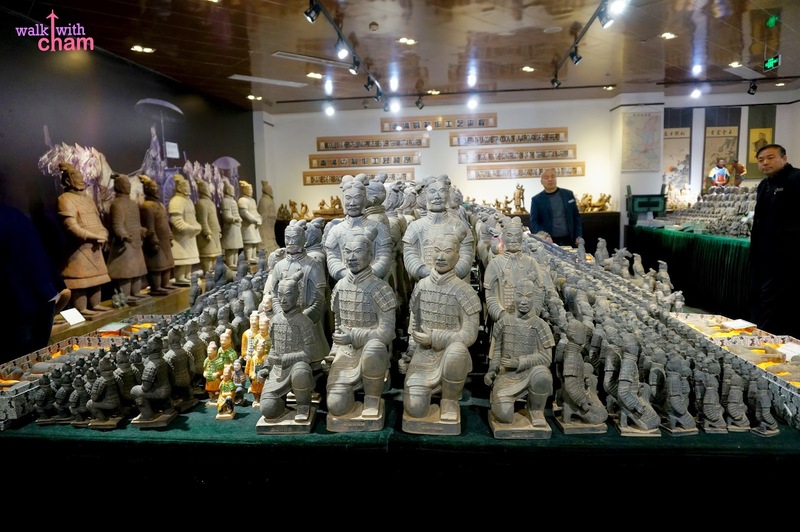 Kindly take note that there are fake farmers who sign books and charge the same amount to tourists claiming that they are one of the farmers who discovered the Terracotta. 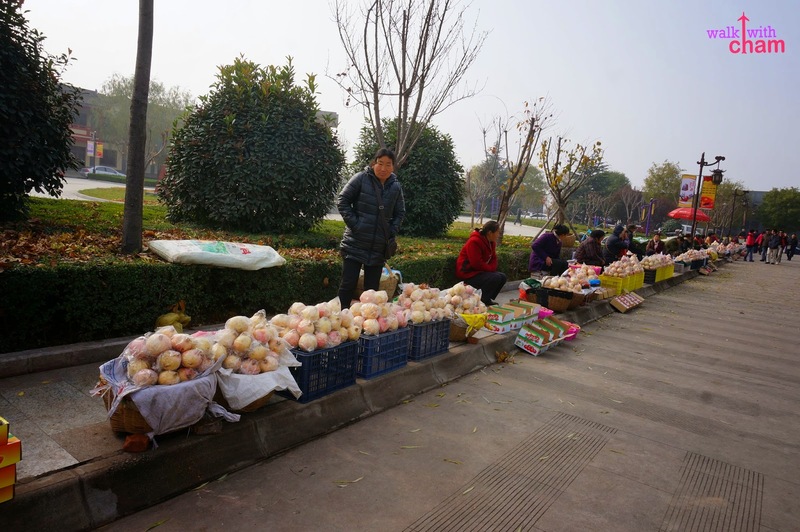 I read that one of those fake farmers is named Yang Xi'an so please do not fall for him. 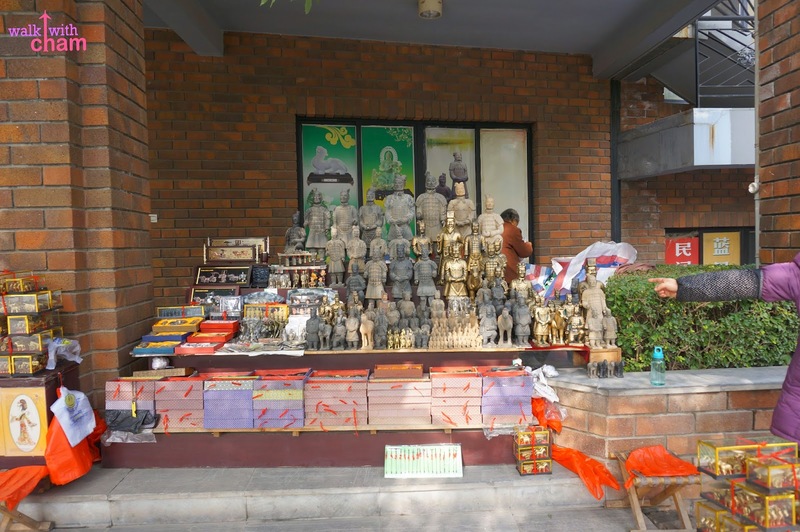 For cheap souvenir items look for the shop below, you can find it when you exit the museum. 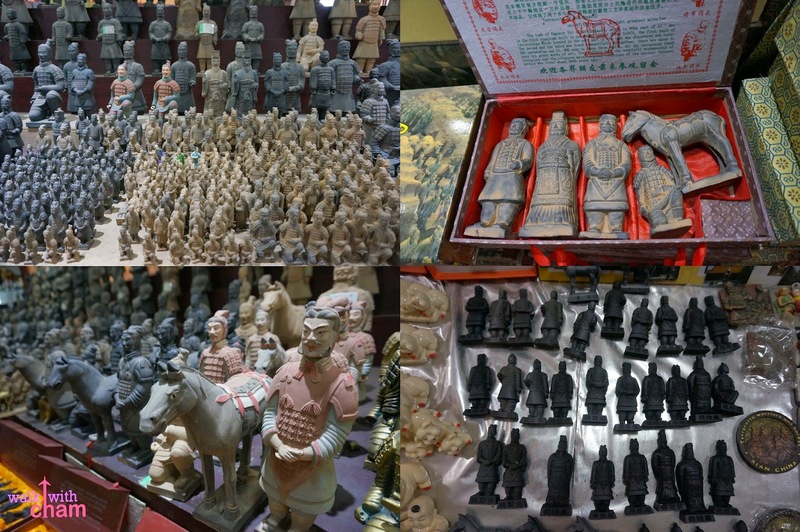 They sell different artifacts and souvenir items such as terracotta warrior displays, magnets, keychains and many others. 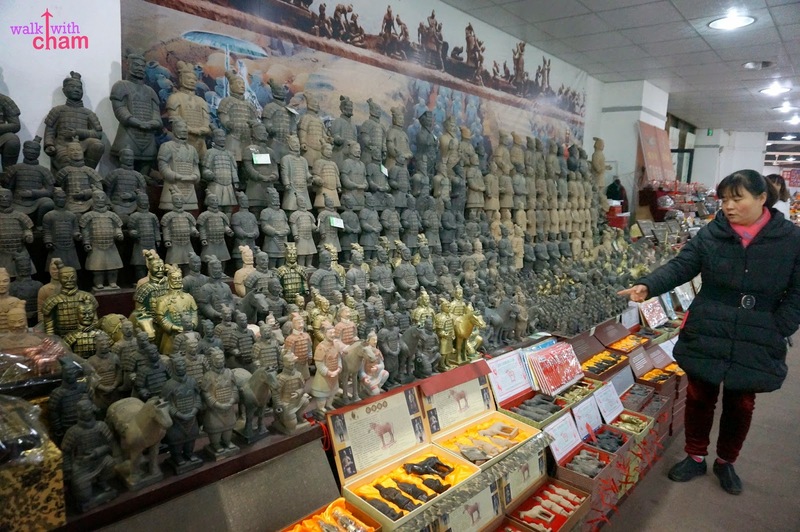 I bought a box of 5 terracotta armies, 1 terracotta warrior and an archeology box. 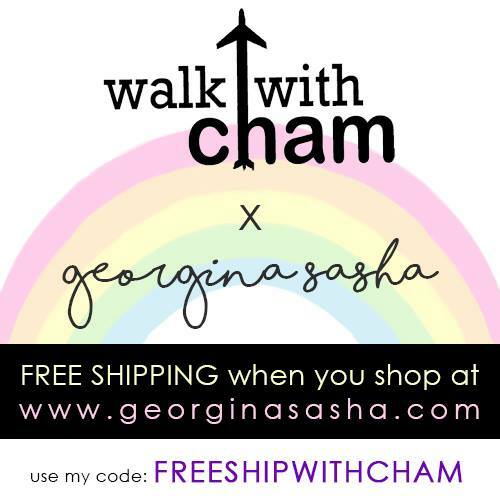 Don't forget to haggle. Walking towards the bus stop we saw different local snacks. My mama bought sweet potatoes and pomegranate. 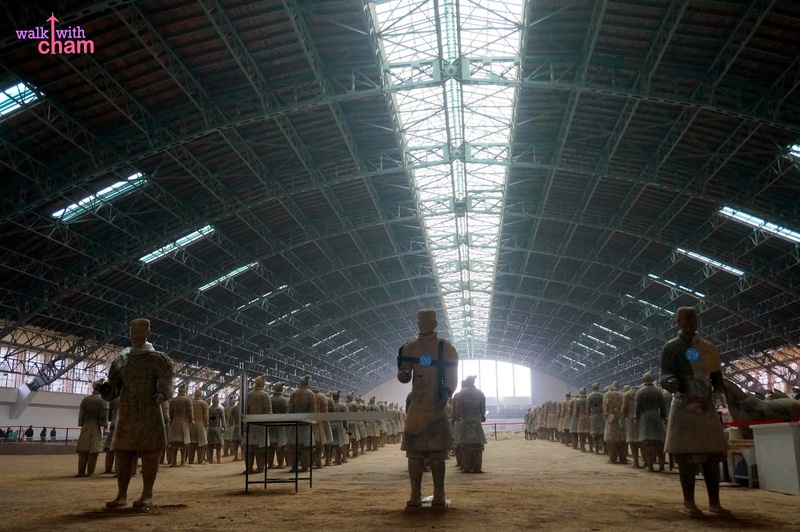 Traveling to Xi'an for 12 hours and going back to Beijing for 5 hours just to see the Terracotta Warriors is worth all the pennies, hassle, lack of sleep, stress and most of all no taking a bath for 1 day and 1 night. Wow. Just wow.